This is the third consecutive year of my Christmas card analysis, see the previous results here and here. Thinking about it, I've realised that some of my categories are a bit arbitrary - the only certainty is the shape of the card itself. 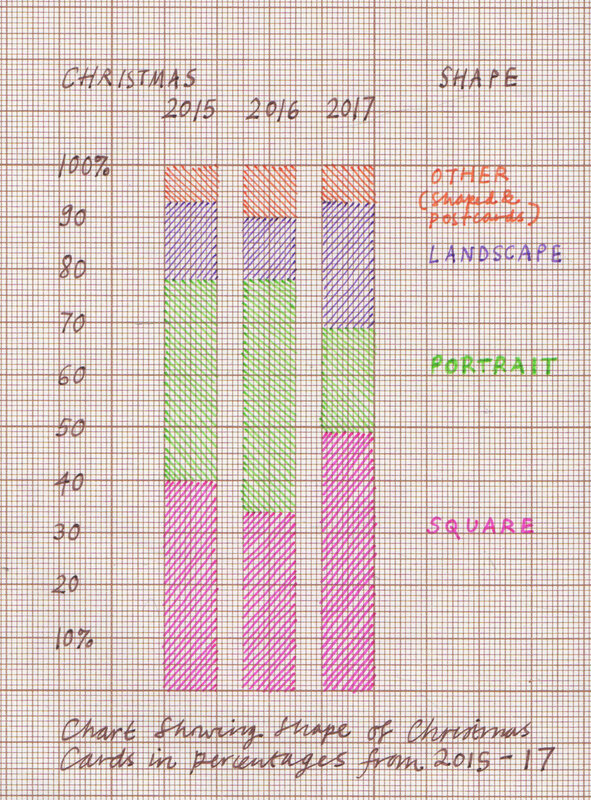 This year the square ones have leapt up to 49% as shown in the chart below. Portrait shaped cards look the best on the mantlepiece, but they were in the minority this year. Some good ones on the mantlepiece, in case you're in doubt - square, portrait, other, sq., sq., sq., portrait, sq., sq. Cards go sideways on the walls. Last year, I was sad about the dropping off of home made cards, as opposed to home (digitally) printed cards. This year I've stopped being so picky and the category title is "a card made by the person who sent it" (31%), not must change over the survey period for this homemade category. In terms of subject categories, there were more birds than ever (11 including 4 robins) and 6 cards that included pictures of deer. Only 1 with angels, 2 of the virgin & child and 2 nativity scenes - one of them in stained glass - hurray! But, as I said, my categories are getting confused. In the past I've had "reproductions of well known artworks" and "snow scenes". There are some obvious category-straddlers here, with the robin in the snow (above) & the Edward Bawden deer (below). I hate to choose an overall winner, although I don't think there is a big overlap between people who send me cards and those who read this blog. Four favourites below are Robert Rauschenberg's Gold Painting, Janina Konarska's Skiers, Edward Bawden's Deer and Trees, and a mistletoe print - there is such a lovely texture on this genuine handmade item. Part One analysed the spread of cards from Christmas 2015, as you can see if you follow this link http://www.sashaward.co.uk/blog/2016/1/2/analysis-of-the-christmas-cards This year, I enjoyed the arrival of the cards even more as I anticipated what fun I would have counting up the varieties of manufacture, shape and subject matter once the whole business of Christmas was over (hooray!). The 2016 statistics are as follows: 20% home made, 14% home printed, 66% bought. 34% square, 43% portrait, 12% landscape, 5% postcards, 5% shaped. Not much change from last year, but I'm glad to see that home made cards are slightly on the increase while square cards - awkward to display I find - are slightly on the decrease. The most popular subject matter was one of my favourites, a snow scene (7), see above, with examples showing Vermont, London, Siberia; streets, parks and gardens. There were 6 cards of single trees, 6 of birds - 4 of these actually recognisable species, see below. The main difference between this and last year's cards is the dropping off of reproductions of well known artworks. Last year's most popular category was down to one example this year, a disturbing state of affairs slightly alleviated by the two stained glass cards we received. You can see these on the mantlepiece below, particularly thrilling is the card on the right which shows the stained glass before and after restoration. My favourite cards on the mantlepiece, particularly the patterned ones in the middle with seasonal colours and glitter! Click to enlarge.